Claude V. King entered college with plans to become an archaeologist, but God called him to begin working with people. While he was studying to become a pastor, God led him to become trained to equip lay people for ministry. Claude's degrees in theology and adult education prepared him to work as a design editor of discipleship courses at LifeWay Christian Resources. 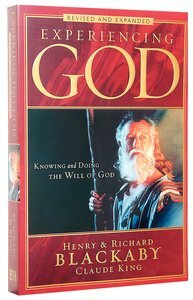 In this role he worked with Henry Blackaby to develop Experiencing God and other discipleship studies. The widespread success of those works led to other writing opportunities. Claude has written or coauthored 20 books that have sold more than five million copies in aggregate. While writing Made to Count Life Planner, Claude served with the North American Mission Board as the prayer-strategy coordinator in New York City for New Hope New York. He has recently returned to work at LifeWay as an Editor-in-Chief of undated resources.